SAP has created a consortium of business partners to help it craft applications for a cloud-based blockchain platform that can track goods from creation to shipment to manufacturer as part of an automated supply chain system. The software giant is piloting its SAP Cloud Platform Blockchain with 16 farm-to-consumer produce suppliers such as Maple Leaf Foods, Johnsonville, Naturipe Farms, Tate & Lyle and Natura. SAP’s blockchain-as-a-service (BaaS) provides an abstraction layer that supports open standards, offers built-in integration with SAP applications. SAP customers who use its Cloud Platform can opt in to pilot the blockchain ledger that runs on it, according to Hala Zeine, president of SAP's Supply Chain and Manufacturing group. From there, customers will soon be able to use APIs to connect the blockchain network to other applications, such as SAP HANA, an in-memory relational database managment system, according to the company. 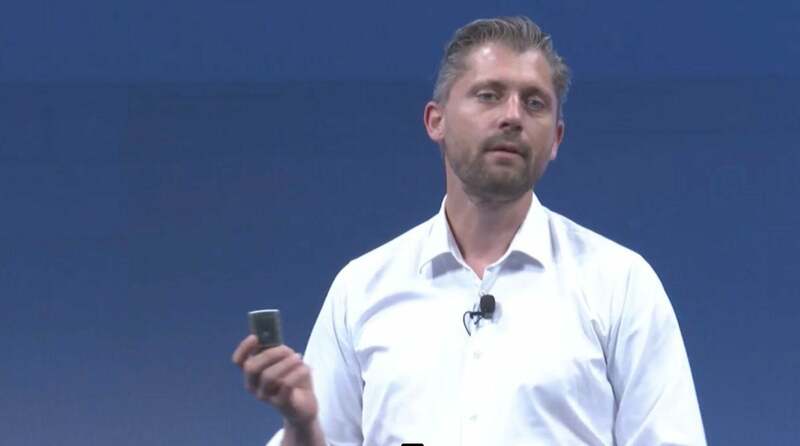 "SAP's customers first connect to its [cloud-based] applications and then connect those applications to its blockchain platform as an option they can turn on," Zeine said. The company recently created a partner consortium consisting of seven companies, including Intel, Hewlett Packard Enterprise Co. (HPE), UPS and A3 by Airbus SE, to help it develop a global supply chain platform. 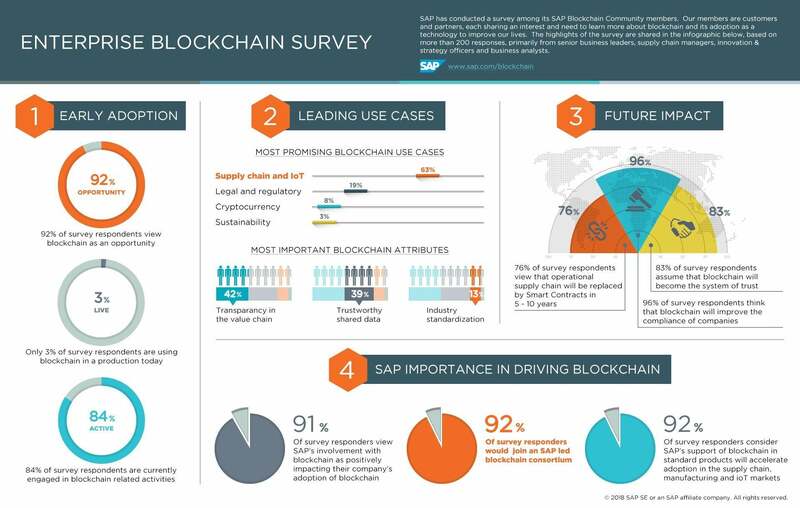 SAP surveyed cloud customers using its blockchain ledger and found 92% saw it as a potential business opportunity and, more specifically, 63% saw it as a supply chain – with IoT as the most promising application for it, Zeine said. While SAP Cloud Platform Blockchain has been in production for several months, the applications that will enable data from various specific industries to be entered remains in development. Next month, SAP will meet with consortium members to hammer out a road map for developing those applications with its partners. In all, about 65 companies are participating in SAP's co-innovation blockchain initiative. The goal: to help customers use manufacturing and supply-chain products – augmented by blockchain – to enhance transparency, safety and collaboration in industries such as transportation, food, and pharmaceuticals. SAP is not alone in developing such a supply chain tracking system. In January, Maersk and IBM announced a joint venture to deploy a blockchain-based electronic shipping system that will digitize supply chains and track international cargo in real time. This month, the companies announced 94 partners have signed on to pilot the system. 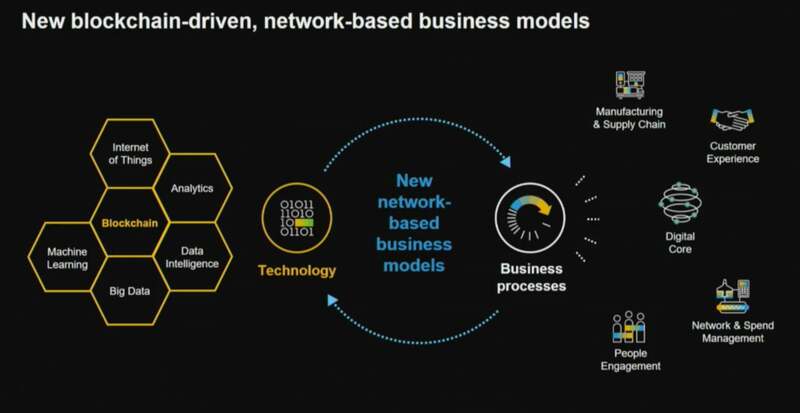 SAP customer Modum, a start-up vendor of IoT sensors and tracking software, has been working with SAP Innovation Center Network to bring together sensor data with SAP's cloud blockchain service. Modum's sensors can monitor the condition of packages in transit for temperature, humidity, vibration and light exposure to help customers comply with safety regulations or quality requirements. The sensors in a package can be syncronized via NFC or Bluetooth with a app on a mobile device and data can be uploaded to a blockchain ledger where smart contract technology automatically sets the parameters on the IoT device required for safe shipment. Modum/SAP's IoT application that has executed a smart contract, uploading the parameters required for shipping a sensitive package. For example, a drug being shipped may need to be maintained within a 20 degree temperature range. Once a package is delivered, the sensor data can then be again uploaded to the immutable blockchain ledger for authorized parties to read. "All the tempature data is read out and uploaded to the cloud and evaluated in a smart contract in the blockchain...[by] the sender, the receiver and the logictics company," said Marc Degen, the co-founder of Modum. Marc Degen, co-founder of Modum, holds an IoT sensor that can record the temperature, vibration, humidity and light exposure to a package being shipped and transmit that data to a blockchain ledger. Modum had already been using Ethereum blockchain technology, but through SAP it is now also able to offer a Hyperledger-based blockchain. Modum is also beta testing SAP's HANA relational database service in conjunction with its blockchain ledger, enabling data to be transmitted between to two. "We work a lot with the start-up community in an incubator. So, we started the SAP IoT Accelerator, a co-innovation program for B2B startups for supply chains," Zeine said. The total number of connected IoT sensors and devices is expected to leap from 21 billion this year to 50 billion by 2022, according to recent data from Juniper Research. Through its smart contract business automation software, blockchain offers a way to automatically connect and transmit data from those IoT devices onto an electronic ledger via a peer-to-peer network that eliminates the need for a central server. Paul Brody, Ernst & Young's (EY) Global Innovation Leader for Blockchain Technology, said in an earlier interview the blockchain market over the past 18 months has been moving through an "explain this to me" phase (PowerPoint) into the "prove it to me" phase (working conference room pilots). "Now we're in the 'Okay, build it for me' phase," Brody said via email. "We see this in our business: clients are moving projects towards production and...we have similar conversations with others in the industry." Deloitte CTO Bill Briggs agreed: "You can go industry by industry and you're seeing concepts proven, pilots now moving into production. Things like supply chain validation, food safety verification, consumer products companies and potentially industrial and even life sciences companies are starting to circle it." Recently, Walmart announced it completed a blockchain proof-of-concept with IBM called FoodTrust to track the origins of its produce from farmer to store. The Food Trust pilot group also included Dole Food Co., Driscoll's Inc., Golden State Foods, Kroger Co., McCormick and Co., McLane Co., Tyson Foods Inc. and Unilever NV, according to IBM. The state of Arkansas, where Walmart is headquarted, also just held a " Blockchain for Arkansas " summit launching a statewide initiative to use blockchain for food safety by tracking it in real time. Additionally, the world's major jewelry and gem businesses are deploying blockchain electronic ledgers that will verify the origins of their products, all the way from the mines to the retail cases. 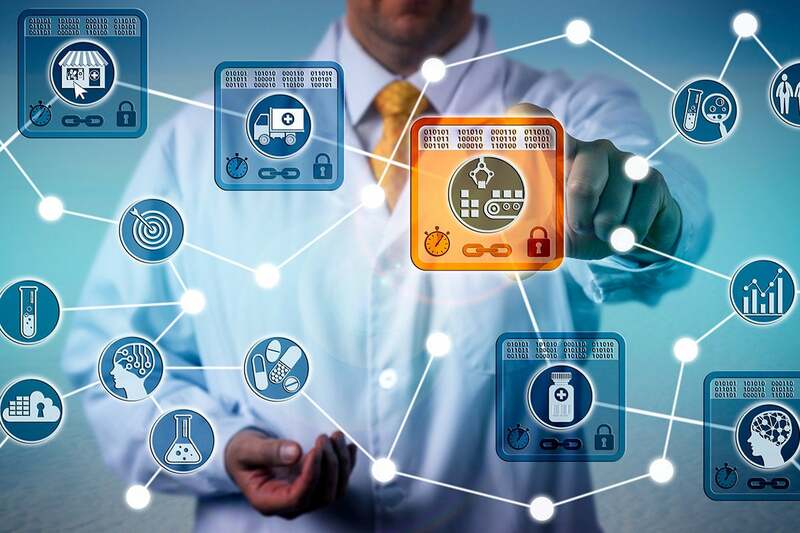 SAP's "Advance Track and Trace" application is already piloting the blockchain technology with pharmaceutical companies, including Merck & Co., Amgen Merck KGaA (Merck Group), GSK (Glaxo Smith Klein), McKesson, AmerisourceBergen, and Boehringer Ingelheim. "Many of the top pharmaceutical companies use our systems as I described – all the way from when the ingredients was produced to moving it...and then ultimately getting combined with each other," Zeine said. "So, the form of material is changing as it's manufactured and finally gets transported. There is a need to ensure it's transported and warehoused in the appropriate way. "The collaboration [with modum.io] is just starting, but that's ultimately where we'll be going with them," she added, referring to the use of IoT devices to automatically track not only final product shipments but the ingredients that go into the drugs. Because the IoT sensor tracking portion of the blockchain network is not yet fully implemented, packages must have their bar codes scanned into the SAP blockchain tracker. "We can't move the human completely out of the supply chain but we can at least ensure the integrity of the data – and the ability to track it across multiple collaboration partners as you move upstream all the way to the patient is definitely something that eases friction," Zeine said. The pharma industry, in particular, has been under scrutiny to ensure it can trace from origin to consumer the drugs it makes and sells. Last month, Chinese pharmaceutical firm Changchun Changsheng Life Sciences Ltd. came under investigation for allegedly falsifying records related to the production and shipment of a rabies vaccine. Changsheng admitted its guilt and agreed to co-operate with state drug regulators on an internal investigation, according to a report. The Changchun controversy prompted China's blockchain enthusiasts to use the blogsphere to call for the entire pharmaceutical industry to adopt blockchain tamper-proof ledgers to track the manufacture and shipment of drugs. Others countered by writing that blockchain cannot prevent fraudulent behavior, i.e., if erroneous data is entered, then it matters little how accurately it's tracked along the supply chain. There's also the problem of drug knock-off companies, which mass produce generic drugs and flood the market with products that may not yet be approved by regulators, Zeine said. Having a product certified as having been tracked from manufacturing to store shelf would ensure authenticity. Additionally, certain drugs must be transported and warehoused at specific temperatures. IoT sensors would enable that to be tracked, as well as checking the amount of vibration incurred during the shipping process, which could alert managers as to whether damage may have occurred. "I think blockchain in and of itself is a technology that is there. That part is not in development," Zeine said. 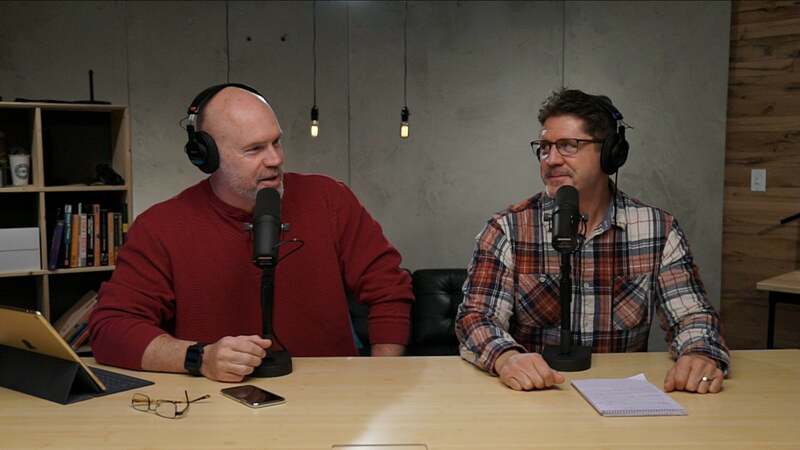 "The part that's really in development is exploring how to take such a technology...[and use it to] remove friction from business processes and create greater transparency and authenticity and collaboration between different network providers. "The magic is getting [that] process defined and making [it] as frictionless as possible. You need to track along the way some of the mandatory audits, and you have to define what are the different materials involved in the process," Zeine said.